We’ve been digging into the highest profile startup accelerator programs to understand how they contribute to the top of the venture capital funnel. So far, it’s been revealed that Y Combinator companies comprise 4% of Series A deals and that, taken together, the top 3 accelerators account for nearly 10% of Series A recipients. 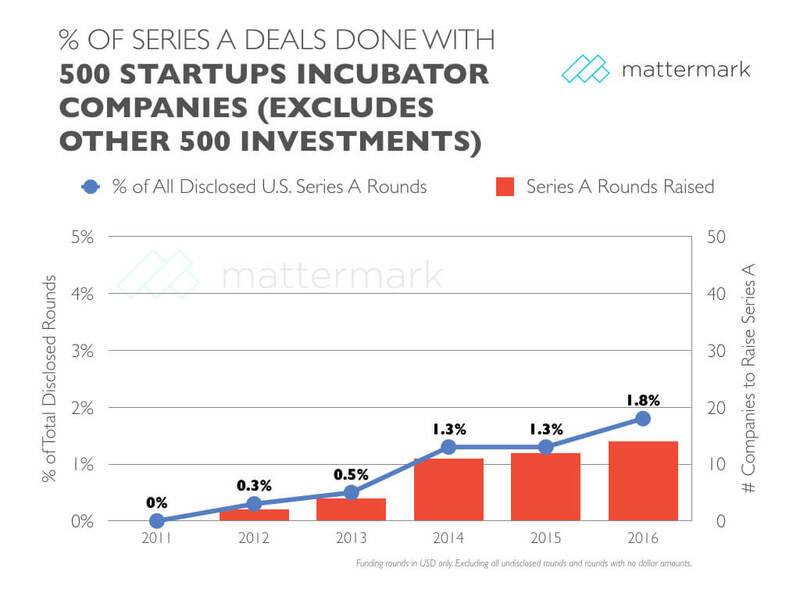 We initially looked at the yearly contribution to Series A, regardless of program maturity, and saw that 500 Startups produced 1.8% of Series A recipients in 2016. While this lags behind Y Combinator and Techstars, we were not accounting for the years since inception — which give each program time to accumulate a larger portfolio base with the potential to go on to raise their Series A. In the first 6 years since inception, both Techstars and 500 Startups outpaced Y Combinator for cumulative Series A backed startups generated, and the current trend looks promising for the newest entrant of the three. For the most recent year (year 10 for Techstars and year 12 for Y Combinator), the cumulative total shifted to slightly favor Y Combinator, who has a 2 year lead. 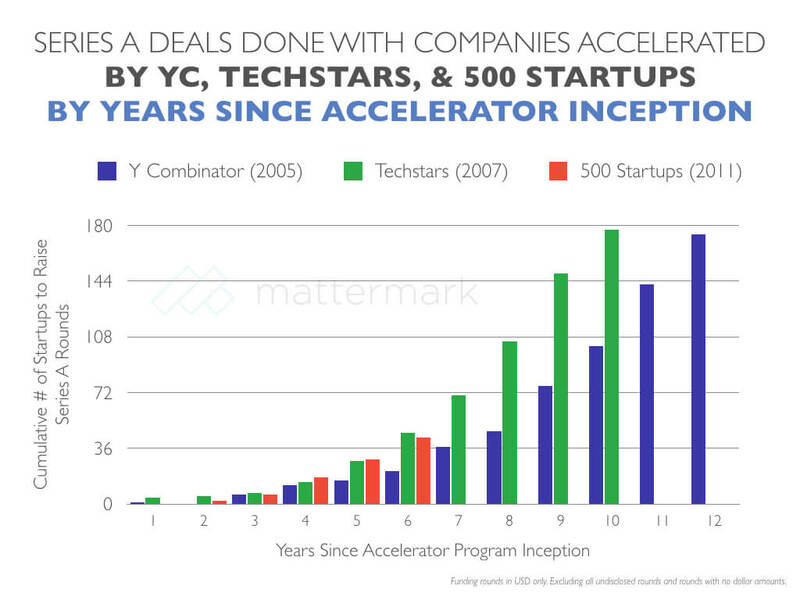 However, from a pace perspective, Techstars is still in the lead, taking 2 fewer years to reach that number of Series A deals than Y Combinator did. With a higher volume of startups going through 500 Startups than the other two programs, it will be interesting to see how Series A graduates in 2017 impact the trend and whether they’ll pull ahead into 1st place ahead of Techstars for the year 7 side-by-side comparison. It is also worth noting that each program’s success paves the way for future programs to get off the ground more quickly, attract applicants, and raise funding. While it is accurate to say “Techstars got there 2 years” earlier, it is important to note this is what we would expect to see happen. This serves as a very good demonstration of why technology startup investing truly is an ecosystem. Looking to re-create this analysis, or perform a variant of it on your own? Get access to all the underlying data for this report completely free for 14 days when you sign up for a Mattermark Pro free trial. It’s like a Bloomberg terminal, but for startup investors, corporate development teams, and anyone looking to sell and market to high growth companies!